Aloo Aur Sabut Lal Mirch Ki Bhujia recipe by Nazia Nazar at PakiRecipes.com. 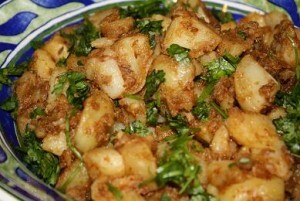 This spicy aloo dish is made quickly and is always delish. Pour chutney of your choice on top for a tangy touch. Fry the onions and red chillies together. When the onions are brown, remove them and the red chillies with a slotted spoon. Let them cool slightly, then crush them lightly with your hands. In the same oil fry the potatoes till they are light golden in colour. Add the tomatoes and salt , stir and fry till the oil seperates. Return the crushed onions and red chillies to the pan. Cover the pan and simmer over a low heat.